Last summer, 3rd Battalion, 7th Marines, shifted gears partway through its deployment to Afghanistan. After months in relatively quiet northeastern Nimroz province, the unit moved to Sangin, one of the country’s most violent districts. The differences were immediately apparent to Marines on the ground, as you can see in this video highlighting their deployment. 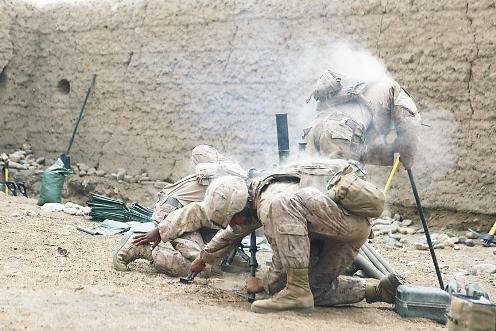 They faced regular firefights as they pushed into Sangin’s Northern Green Zone, and terrain riddled with improvised explosive devices. Several Marines were killed in the first few weeks there, with Lima Company facing a sniper who drew blood numerous times. The unit, out of Twentynine Palms, Calif., was replaced late in September last year by 3rd Battalion, 5th Marines, who sustained heavy casualties from the start. In fact, 3/5’s story was so jarring to outsiders that some didn’t realize they weren’t the first Marine battalion in Sangin. One year later, 3/7 is gearing up for a fight again. As this San Diego Union-Tribune story points out, they’ll be heading back to Sangin this fall to replace 1st Battalion, 5th Marines, which took over for 3/5 earlier this year. They’re not the only one preparing for war. Second Battalion, 4th Marines, out of Camp Pendleton, Calif., is currently with 3/7 at Twentynine Palms for predeployment training. Marines with 2/4 will deploy this fall to Musa Qala and Now Zad, where 3rd Battalion, 2nd Marines, out of Camp Lejeune, N.C., has handled operations for most of this year. No doubt each deployment to Afghanistan brings a more savvy and experienced group of marines to the battlefield. We pray for lower or no casualties each time our boys return to the fight!! good, hurry the f— up and replace us 2/4! I met a Marine being deployed at the Star Trek Convention in Vegas over the weekend. I promised to keep in touch while he’s over there and then promptly lost his contact info. If any of you know someone who was there this weekend and being deployed to Afghanistan in the near future will you pass it on that I’m looking for them on here? Thanks! And thank you for all you do! I was part of 3/7 for the initial push into sangin, and now im going back there again. I was also part of Musa Qula, where 2/4 is going.